Please join us at our April Music Makers PTA meeting, on Wednesday April 17th at 6:30pm, where we will be discussing plans for the upcoming Spring Concerts, and making plans for the end-of-year PTA board elections. Please come by, especially if you are interested in holding a PTA board office! The meeting will be held in room 104 at the Newhall School District offices on the corner of Wiley Canyon Road and Orchard Village Parkway. Order your "Got music?" hoodie right here for a donation of $25 through our PayPal order form below. 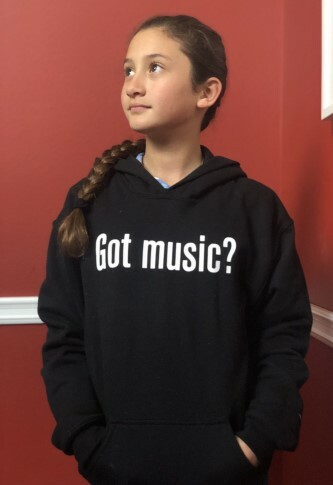 Your hoodie will be delivered in about one week to your student at school by their music teacher. Note that donations for this campaign can only be made online. The music teachers will not collect donations directly from the students at school.